We’d love your help. 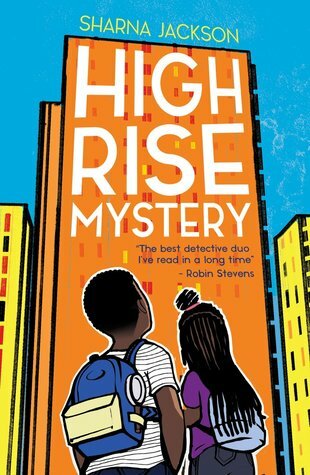 Let us know what’s wrong with this preview of High-rise Mystery by Sharna Jackson. Summer in London is hot, the hottest on record, and there's been a murder in THE TRI: the high-rise home to resident know-it-alls, Nik and Norva. Who better to solve the case? Armed with curiosity, home-turf knowledge and unlimited time - until the end of the summer holidays anyway. The first whodunnit in a new mystery series by The detective duo everyone is dying to meet! To ask other readers questions about High-rise Mystery, please sign up. In the middle of a stifling heatwave; in n estate in South-East London, two sisters make a horrible discovery. One of their favourite residents, Hugh Knightley-Webb, antiques dealer and supervisor of the Art Club is found murdered. But these two aren't just your run-of-the-mill kids trying to stay cool in the blistering heat. Nik (age 11) and sister Norva (13) are detectives. They are clever. They are incisive. And they are now on the case! Rumours are running wild on the estate; the police are In the middle of a stifling heatwave; in n estate in South-East London, two sisters make a horrible discovery. One of their favourite residents, Hugh Knightley-Webb, antiques dealer and supervisor of the Art Club is found murdered. But these two aren't just your run-of-the-mill kids trying to stay cool in the blistering heat. Nik (age 11) and sister Norva (13) are detectives. They are clever. They are incisive. And they are now on the case! Rumours are running wild on the estate; the police are short-handed and under pressure. . Nik and Norva will never, ever ignore the evidence; even when it leads them to a chief suspect that is a little to close to home for their comfort. Nik and Norva will are determined to get the truth (whatever it is) and no one will stop them. I absolutely loved this book. It really resonates with young people. Sharna Jackson does for inner city youngsters what Lauren Child done for 5year olds with Lola. Nik and Norva are two very different siblings with one big thing in common. They are detectives! They are nosey, gobby and always on the lookout for a new mystery. Only it hits a bit too close to home when they find friend and art teacher Hugo dead! But who done it!? All the evidence points to their dad, but when he is arrested, they I absolutely loved this book. It really resonates with young people. Sharna Jackson does for inner city youngsters what Lauren Child done for 5year olds with Lola. Nik and Norva are two very different siblings with one big thing in common. They are detectives! They are nosey, gobby and always on the lookout for a new mystery. Only it hits a bit too close to home when they find friend and art teacher Hugo dead! But who done it!? All the evidence points to their dad, but when he is arrested, they are under pressure to prove his innocence. Nik and Norva are thrill seeking teenagers, with crushes, love for music, sarcastic remarks and an eagerness to solve mysteries. I was sent a finished copy in exchange for an honest review. Thank you Bounce Marketing I knew I was going to love this book! Not only is it an amazing read but it is also a very much needed novel as we need more books for children published with diverse characters like this. Nik (11) and Norva (13) are sisters and live with their Dad in a tower block called the Tri. When their friend and art teacher Hugh is found murdered Nik and Norva are determined to solve the case even more so when the main I was sent a finished copy in exchange for an honest review. Thank you Bounce Marketing I knew I was going to love this book! Not only is it an amazing read but it is also a very much needed novel as we need more books for children published with diverse characters like this. Nik (11) and Norva (13) are sisters and live with their Dad in a tower block called the Tri. When their friend and art teacher Hugh is found murdered Nik and Norva are determined to solve the case even more so when the main suspect appears to be someone very close to them! So, so good. Really great mystery that kept me guessing, wonderfully written and infinitely enjoyable. Can’t wait for the next instalment!